The great outdoors is even greater with a cool drink, a fine meal and climate control. 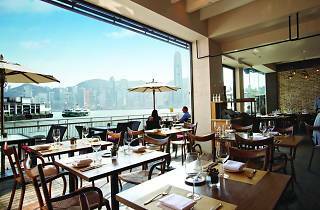 Soak up the sun at one of these breezy, beautiful Hong Kong alfresco venues. Imported directly from the US by French chef Laurent Tourondel, this modern American steakhouse comes with an impeccable reputation. The buttery beef fillet and tuna tartar come especially recommended. Shop G62, Ocean Terminal, Tsim Sha Tsui, 2730 3508. $1,400; diningconcepts.com. Clean air, panoramic sea views, and a good mix of Eastern and Western favourites are the secret to this poolside café. After lunch go for a stroll on the beach or in the hotel’s lush 10-acre garden. Hong Kong Gold Coast Hotel, 1 Castle Peak Rd, Gold Coast, 2452 8888. $400; sino-hotels.com. The perfect way the end a day – after a few beers you might as well be in Thailand. You’ll return for the laidback atmosphere and classic Thai dishes. G/F West Block, Island Rd, Deep Water Bay, 2812 1826. $200; cocothaikitchen.com. 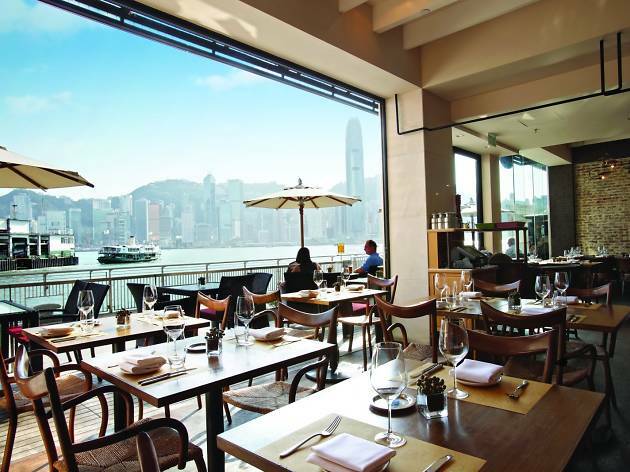 This Italian restaurant is hugely popular – and not just for the breathtaking views of Victoria Harbour. The sleek and spacious look keeps a steady flow of patrons coming. Big favourites are the mouth watering Parma ham pizza and handmade pastas. Podium 3 & 4, IFC Mall, Central, 2383 8765. $800; gaiagroup.com.hk. Don’t go for the food because you’ll be disappointed. However the park ambience will leave you raving. Other than McDonald’s, we can’t think of other eateries in our urban parks, making this a real find. Hong Kong Park, Admiralty, 2522 6333. $400; l16.com.hk. Breathe in the spectacular harbour view between a bite of Peking Duck and Braised Lobster – or order from their Thai menu if you prefer. Harbour Plaza Metropolis, 7 Metropolis Dr, Hung Hom, 3160 6882. $500; harbour-plaza.com. The nostalgic ambiance and garden seating attract tourists and dog owning locals alike. The international cuisine is nothing special though. Book ahead if you intend to visit on evenings and weekends. 121 Peak Rd, The Peak, 2849 1000. $600; peaklookout.com.hk. This is poolside dining at its best. Choose from their à la carte menu, or even better opt for the BBQ dinner buffet. On lazy sunny weekends, bring your swimming gear and splash around all day. Grand Hyatt, 1 Harbour Rd, Wan Chai, 2588 1234. $800; hongkong.grandhyatt.com. Their all-you-can-eat champagne buffet is very popular. While the food is only average, the setting is unique. Where else can you book a marquee on the roof of a floating restaurant? Shum Wan Pier, Wong Chuk Hang, Aberdeen, 2552 3331. $600. Its huge terrace (previously home to the Dirty Duck Diner) overlooking Lockhart Rd elevates this classic Wan Chai pub to a more sophisticated level. One comes for their extensive beer list and British culinary delights. 5/F, 54-62 Lockhart Rd, The Broadway, Wan Chai, 2110 1513. $300.